Degenerative joint disease is a factor in a significant portion of patients that musculoskeletal practitioners provide assistance to. Knee problems are commonplace, particularly in an ageing population and with increasing levels of obesity. Since degenerative joint changes are variable, gauging status and progression enables clinical care and advice to be as customised as possible. The knee is one of the most common joints to degenerate. As with other synovial joints, typical imaging features include some or all of: joint deformity/subluxation, osteophytes, subchondral sclerosis/cysts, intra-articular loose bodies and non-uniform joint space reduction. This joint space loss involves both meniscus and articular cartilage changes, with the medial tibiofemoral compartment being the most affected. While weight-bearing X-ray is suitable for diagnosing DJD overall, various associated soft tissue pathologies cannot be evaluated with this imaging method. With the added advantage of no radiation, weight-bearing MRI can complement or be used instead of X-ray to gain a better understanding. The accuracy of MRI for detecting meniscal pathology is 90%-95%. A combination of imaging sequences is necessary to achieve this accuracy. The structure of the meniscus is seen well on proton-density and T1-weighted sequences, while T2-weighted and/or STIR imaging is best for pathology. Meniscal pathology can be graded from I to III, according to location and extent of the T2-weighted/STIR signal change. Grade I and II signal changes are indicative of degeneration in adults or normal vascularity in children. 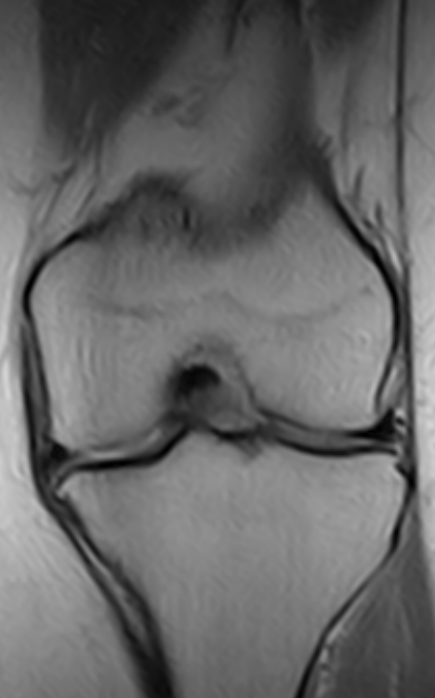 Grade III changes represent a meniscal tear. Mrs S, a 68 year old retired office worker was referred by her GP for a left knee MRI study. Symptoms had been intermittent over a 5 month period. Particular aggravating factors included climbing stairs and picking up her grandchildren. Based on the combination of clinical history and potential value of making a recumbent/upright imaging comparison for changes related to posture, upright imaging was also performed. Mild to moderate thinning of the medial tibio-femoral cartilage with small marginal osteophytes. Increase in the joint space reduction noted on the upright sequence, when compared to the supine sequences. Complex tear of the medial meniscus associated with mild perimeniscal synovitis. Type II degenerative changes are seen in posterior horn of lateral meniscus. No convincing lateral meniscal tear. 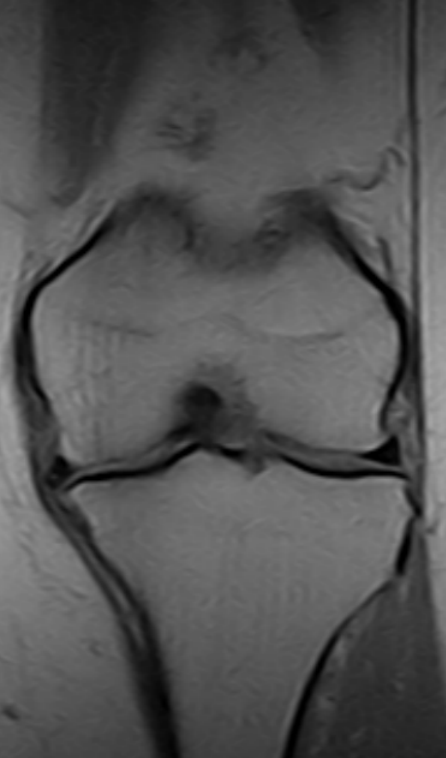 Mild chondral thinning involving the middle pole and medial facet of the patella. This case highlights additional diagnostic information than would be achieved using X-ray alone. This includes the soft-tissue components contributing to the visualised joint space narrowing of the medial compartment. Though MRI is the gold standard for knee soft-tissues, diagnostic accuracy is greatest when imaging findings are carefully correlated with a patient’s symptoms, signs and clinical examination information. Yochum T and Rowe L. Essentials of Skeletal Radiology (3rd Ed). Lippincott Williams and Wilkins 2004. Howell R, et al. Degenerative meniscus: pathogenesis, diagnosis and treatment options. World J Orthop 2014;5(5):597-602. This entry was posted in Uncategorized and tagged knee degenerative joint disease on January 21, 2016 by admin.